Gift a Pantaloon Gift Voucher for the Pure Joy of Shopping. Pantaloon offers the latest trendsetting fashions & styles of apparel - for Men's, Ladies and Kids, accessories, jewellery, stationary, home items, watches, electronic items, chocolates, toys and cosmetics. Pantaloons gift voucher is not encashable. 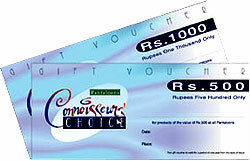 Pantaloons gift voucher can be used only in India. Pantaloons gift voucher is valid upto 1 year from the date of issue. Locate outlets of Pantaloons . . .
Pantaloon Retail India Limited, (PRIL) the flagship company of the Pantaloon group has been one of the pioneers in organised retailing in India. In 1997, PRIL introduced the concept of Megastores/ Familystores, opening first Departmental store in Calcutta. Currently, PRIL has more than 50 stores in various categories of retailing catering to differing needs of customers. PRIL believes in giving value for money products to its customers. Right from sourcing grocery items for housewives to providing ultra-modern apparel or furniture to youth and aspirations, PRIL has exhibited its excellence in every area of retailing. PRIL truly understands its discerning customers and has taken every effort, which will meet their requirements. Customers have equally valued our brands and given “Big Bazaar” top most ranking* in this newly developed category of organised retailing. Way above any other category in organised retailing. Pantaloon is the company's departmental store and part of life style retail format. The company has depth of offering for both men and women at affordable prices. A striking characteristic of Pantaloon has been the strength of its private label programme. John Miller, Ajile, Scottsvile, Lombard, Annabelle, Akkriti are some of the successful brands created by the company.